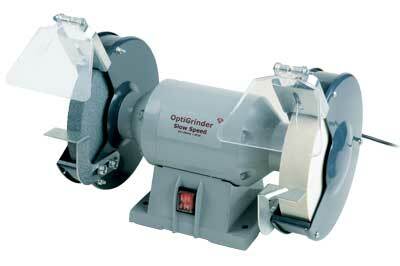 The OptiGrinder is a solid, well-made piece of kit, that is beyond doubt. It came in a well-packed cardboard box, and once out of the box all that was needed was to fix the top spark guarding and the rest assemblies on each side of the grinder guarding. The shielding is the standard clear tilt safety Perspex-type product and the toolrests are simple screw on items. That said, they function, but are not the most sturdy I have come across. Having said that, the beauty of them is that they can easily be removed in order to fit platforms and other sharpening systems we turners prefer to use anyway. That can't be said of some other units which require you to grind off the rests. Once assembled and switched on there was an unsatisfactory degree of vibration on the grinder. Careful examination showed the plastic base had got knocked in during transit, but once removed and reset things were a lot better, but it was further improved by removing the thick and somewhat squidgy rubber feet. We also bolted the grinder down to a couple of wooden battens and placed the whole thing on some rubber routermat. An element of customisation got the best from this precision piece of kit. There was no vibration and the wheels ran true. It comes equipped with one narrow grey K36 AlOx wheel and a wide white K80 AlOx, which are both good quality close-grained wheels. We both prefer 200mm grinders for sharpening tools and this slow-speed version is excellent for this purpose. 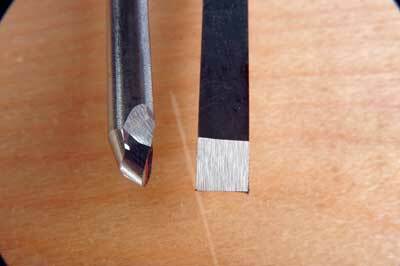 The narrow one certainly hogged the metal away for quick shaping and the white fine-grade wheel has proved to be ideal for sharpening. Overall, a well behaved, quiet machine at a sensible price. If you are looking for a new grinder that is going to be well used, then this is worth looking at. Mark and I always have a potential issue with bench grinders as dry grinding can cause overheating easily and the edge finish using some of the wheels - usually the cheaper end of the spectrum - often isn't that fantastic. Much of this is dependent on the speed of the grinder and also the grit grade and, as mentioned, the quality of the wheel used. There is some debate as to whether high or low speed grinders are best. I think that the slow speed grinders offer many people more control with what I can see as no downside on the cutting edge quality. 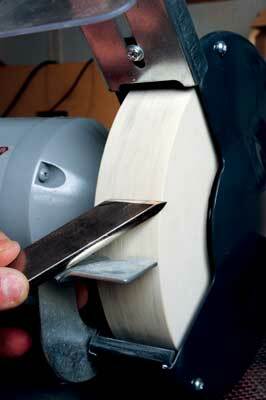 But we wondered if the sharpening process can be refined and enhanced even more? OptiGrind have developed precision CBN wheels with optional extra matching aluminium bushes available to suit specific shaft diameters. What is CBN? The answer is Cubic Boron Nitride, nearly as hard as diamond but far better suited to grinding HSS tools. Normally this would be specific to industry but it has now made accessible to consumers, too. The milled wheels are precisely balanced for smooth running and coated very evenly with CBN. We mounted the finer grade wheel using the precision bush system and once fitted the almost instant level of finish, given the fairly rapid speed of removal, is eye-opening. We looked at its coarser grade cousin in a previous issue. The grinding process is a delight, giving off little if any sparks even on carbon steel tools, a massive reduction in heat generated and having the CBN on the side of the wheel as well gives even more sharpening. If you want to improve cutting edges straight off the grinder this has to be the way to go. 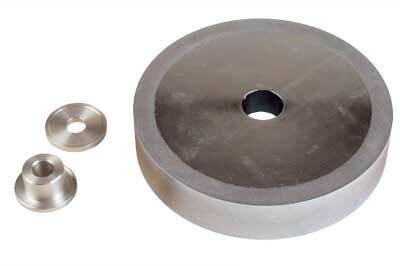 There is a place for AlOx wheels too, alongside a CBN wheel for the best all round edge forming and edge keeping. Yes, CBN wheels come at a price, but top-grade AlOx wheels can cost over £100 now so a little bit more will buy you something that may well last a lifetime. The added benefit is they not only sharpen HSS/hardened steels â€“ they can also be used to sharpen TCT tools. 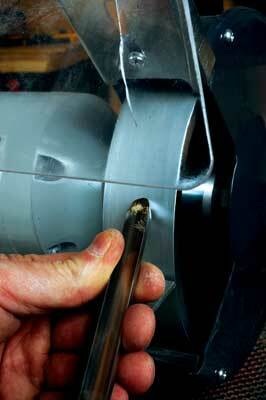 Only time will tell how much of a life decrease or increased wear effect there is on the wheel when sharpening TCT, but on standard HSS you can expect years of life, and there is never a reduction in the wheel diameter. Everything remains a constant - a big plus when sharpening. The wheel certainly was able to cope with everything we used on it and gave a phenomenal edge. If you use a grinder a lot then this is well worth the added cost premium.